Canada has a small and thinly-spread population. Many visual artists, writers, filmmakers, magazines and theatres depend on government funding from the Canada Council of the Arts to supplement their income in order to devote more time to cultural production. Unfortunately, this system also leads to nasty infighting between members of Canada’s artistic community trying to grab parts of a shrinking pool of cash, and has the unfortunate effect of stifling the “wrong kind” of artists as determined by a year’s jury panel. Those who hold the cash also have the ability to determine what is “Canadian” instead of the wider Canadian audience, who in most cases should determine the course of national art in an organic fashion. This wouldn’t be so bad (“Screw them, we’ll just keep produces our own art!”), except that a lot of art just doesn’t get out there or noticed thanks to the legitimacy accorded to a CCA grant. This is especially true in English Canada, where distinct Canadian voices get drowned by the vast amount of entertainment and literature produced south of the border in the same language. On Spec is an important mainstay in Canada’s sf community, partly because it was founded in the 1980s to foster such a community. On Spec let Canadian sf authors submit to an English-language market that wasn’t in the U.S. or Great Britain, letting those writers address Canadian concerns, Canadian fantasies, Canadian futures. I started submitting short fiction to On Spec because it means something to get published there. 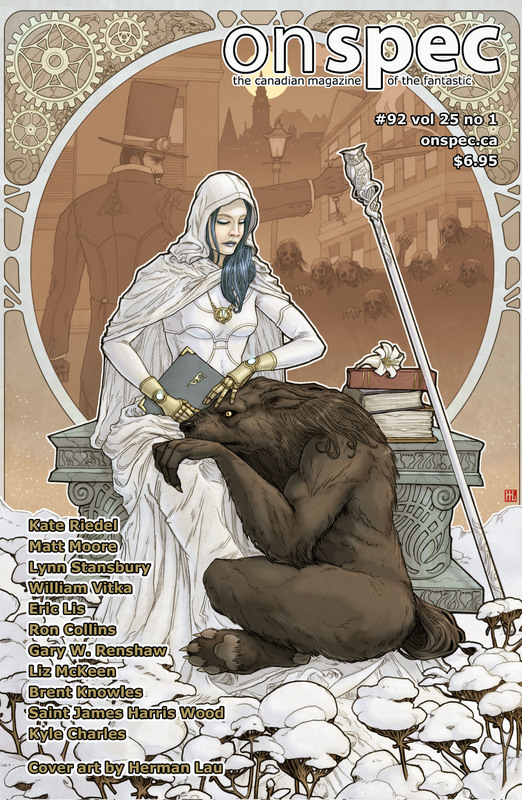 Most importantly, because it was a magazine I really enjoyed reading—every issue of On Spec contained at least one story I found affecting, which is more than I can say for many literary magazines both inside and outside the sf field. Now it could very possibly cease to exist based on the whim of a few people sitting on a jury panel. I wouldn’t know about Herman Lau if it wasn’t for the exposure On Spec gave him. He’s incredible. Check out On Spec’s back issues for more examples. It’s not surprising. In the past few years, the literary side of the CCA has been narrowing the perimeters of what “Canadian Literature” means instead of encouraging a wide range of writing in this country. Arguably, the CCA has always tended to do this. This latest decision tells me that the jury does not see sf as a part of Canadian literature. They do not see my work as part of Canadian cultural production, despite my life in Canada inevitably informing my writing. I’m accustomed to this means of exclusion a member of an immigrant family—being denied participation in the arts because hybrid identities don’t (arguably) produce national art. That is, until your profile is high enough, like when your books sell well and receive recognition outside of Canada, at which point your work gets folded back into the CanLit scene. This is a backwards process. A common one. You can find out ways to support On Spec here.